Samhain Magic (サムハインの魔法 Samuhain no Mahō?) is the 13th episode of the Little Witch Academia anime series. On Netflix, the episode is titled "Samhain Magic Festival". As the festival draws nearer, Akko has a novel idea for spicing up the sacrificial ceremony. But she'll need a lot of help to pull it off. This section is a stub. You can help the Little Witch Academia Wiki by expanding it. Wanting to follow Chariot's example, Akko proposes putting on a metamorphosis show to make Vajarois smile, which prompts Ursula to look into what caused Vajarois' sorrow in the first place. Initially unwilling to get on board with Akko's plan, Lotte and Sucy notice how hard Akko is working to make magic fun and decide to help her in her act. On the day of the festival, as Akko transforms into various shapes to try and entertain Vajarois, Ursula finds an item called Vajarois' Vestige, learning that Vajarois was a princess who had swallowed a seed of sorrow to remember her lost friends, causing her to experience eternal sorrow. Upon receiving this information, Akko and the others go inside of Vajarois and uses the Shiny Rod's third spell to pull the seed of sorrow out of her, allowing her true form to rest in peace. As Akko celebrates her success, despite being disqualified from the running for Moonlit Witch, another figure is seen nearby receiving strange little flying cubes into her hand. It is interesting to note that Sucy was called "Creepy Sucy". An American television series called The Oblongs, which took place in a town afflicted by a chemical spill, featured a character with a similar name, Creepy Susie. As Creepy Susie shares very similar characteristics as Sucy. This was more than likely a reference to the show. In the Netflix worldwide release, the episode name is changed to Samhain Magic Festival. 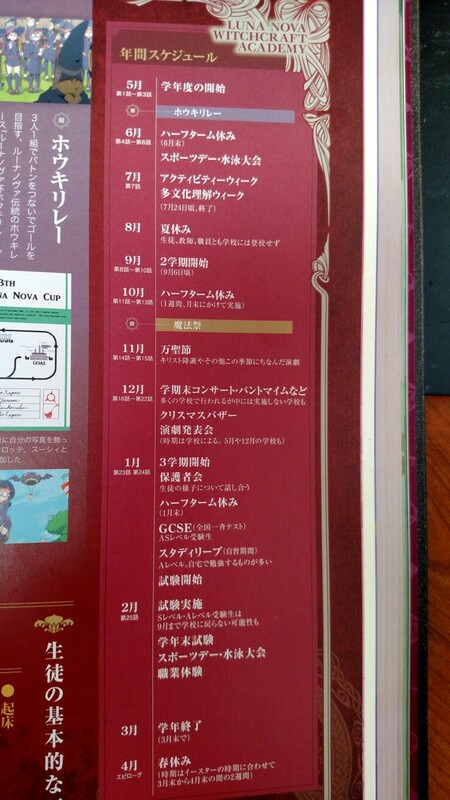 The festival and this episode take place in the end of October, as stated in the chronicles book. The singers of all of the openings and endings themes of the Little Witch Academia anime, YURiKA and Yuiko Ōhara, lend their voices as Luna Nova students. This episode, alongside "New Age Magic", shed a light on shades of gray in Luna Nova. In this episode, while the school responsible to appease Vajarois' restless spirit via. sacrifices which held as part of Samhain Festival, they eventually failed to recognise her as tormented ghost of an ancient princess, and instead seeing her as instrument for the school's annual tradition. Not surprisingly, it became reason why Akko, Lotte, and Sucy, with help of Ursula's guidance and Shiny Rod, eventually put an end of the very tradition that anchored Vajarois in the world once and for all albeit it costed them being disqualified in process. Samhain Magic has an associated gallery here.